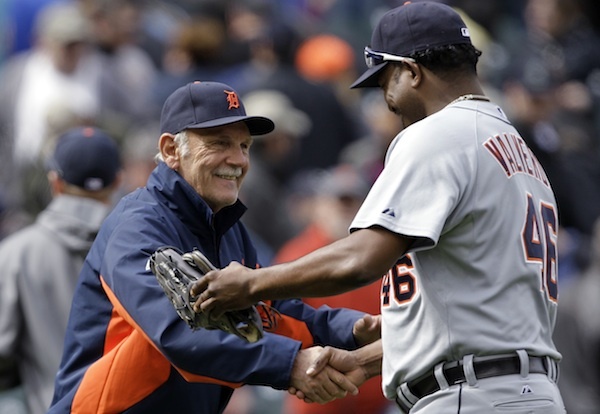 DETROIT — Employing his own personal version of 411, or the White Pages, Jim Leyland was looking for a phone number on Friday, asking a staffer to track it down for him. Jose Valverde had been taken out of his Rolodex, apparently. “I just want to call him. I haven’t really spoken with him, because it just kind of came up real quick yesterday. ... I just want to call him and welcome him back to the organization. But, no, there’s no timetable on anything,” Leyland said before Friday’s home opener. When the Tigers signed Valverde to a minor-league deal on Thursday, the deal was finalized right before the game, leaving Leyland little time to get details from his boss, president and GM Dave Dombrowski before heading to the field. As one of Leyland’s all-time favorite players, though, the re-signing of the deposed closer was a feel-good moment. “Well, I’m happy. I’m really happy for him. I’m happy for us. I think it’s a simple thing, really, to be honest with you. If you really look at the entire situation, I mean, common sense tells you when you’ve got a high-profile agent like Scott Boras last year, and you’re a free agent, it probably dictates — at least most people are thinking — really big dollars and a long-term contract,” Leyland said. “And I think the simple denomination there was that we weren’t really to do that. Obviously it didn’t turn out that way. I think this is a great situation. It’s a no-brainer. Take a look. “I don’t know any of the details of the logistics of it. Most everybody thought this was going to be a long-term contract, and pretty big numbers. Didn’t work out that way. But I’m sure that was the intention originally. What happens from here is that Valverde is scheduled to get some work in during extended spring training, then maybe pitch for Class A Lakeland before heading to Triple-A Toledo. “Those (plans) are just in the infant steps right now,” Leyland admitted. The key things the Tigers will be watching for is whether Valverde’s recovered his lost velocity, and truly has rediscovered his split-finger fastball. Last year, Valverde all but abandoned his once-effective pitch, making him a one-weapon pitcher. “I would say that’s a fair assessment,” Leyland said.